Boasting gentle curves and aluminum that resembles wood, the Reynolds Swivel Lounge Chairs with Side Table Outdoor Set is the perfect choice for any modern yard. This set seats two in swivel lounge chairs with luxurious hidden reticulated cushion seats and motion bases for smooth side to side motion. To ensure no one goes thirsty, this set includes a pair of aluminum side tables perfect for keeping refreshments nearby. Woodard All-Weather Woven furniture is constructed using cutting edge HDPE fibers, hand woven over an aluminum frame painted to resemble wood. 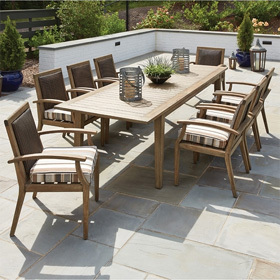 With this combination of resilient, weather-resistant materials and Woodard's quality workmanship, our woven furniture will last for years. Swivel Chairs 35.75"W x 35.75"D x 17"H 45 lbs. Table 20"W x 20"D x 20"H 20 lbs.